There are quite a few details to the situation surrounding Wilcock's new book. The good news is that this book has done extremely well despite the typical cabal manipulation. Hillary and her running mate Kaine's new book, Stronger Together, only sold 2,912 units as of its first week. 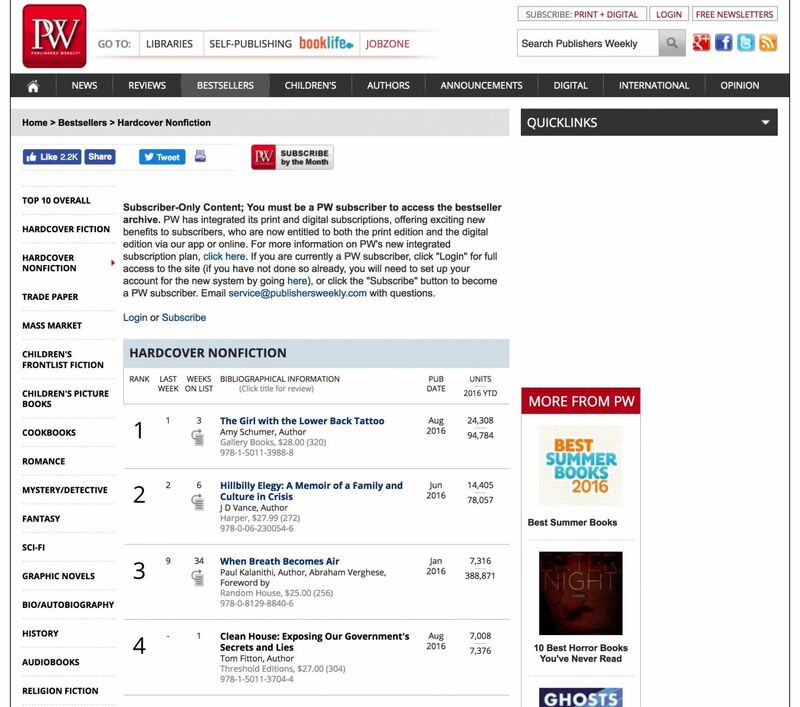 The Ascension Mysteries sits comfortably at #11, based on real-world sales data from the Nielsen ratings, which appears in the Publisher's Weekly list. 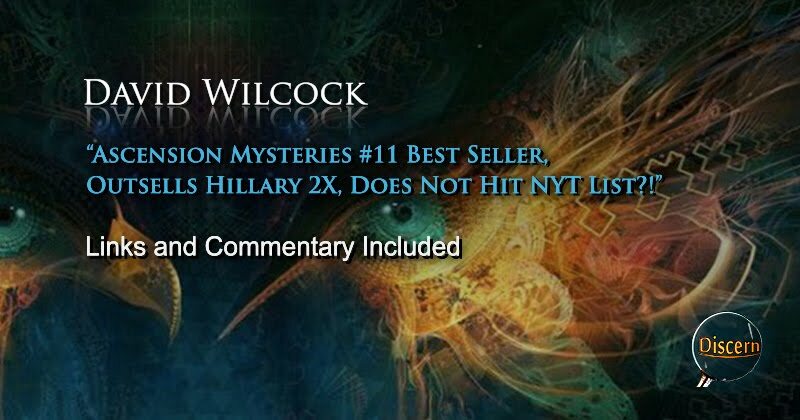 Why, then, did The Ascension Mysteries not appear anywhere on the New York Times list -- particularly since the PW and NYT lists share 12 out of 20 titles? UPDATED next morning! Updates appear as highlights in red. Bad dreams about reptilians... and stuff! FIRST, THE GOOD NEWS.... #11 IN THE WORLD! This sizable achievement wouldn't have been possible without your awesome support -- and for that I sincerely thank you! Our publisher called them up to ask what was going on, and their answer was essentially, "Sorry, you didn't make it." This cannot be based on actual sales figures -- so what the heck is going on here? However, the top-selling books in the Nielsen BookScan database appear, along with their accurate sales numbers, on the Publisher's Weekly best-seller list. This allows you to see "who's who in the zoo" without having to pay monthly fees, get an insider's certification and give up all your personal information. 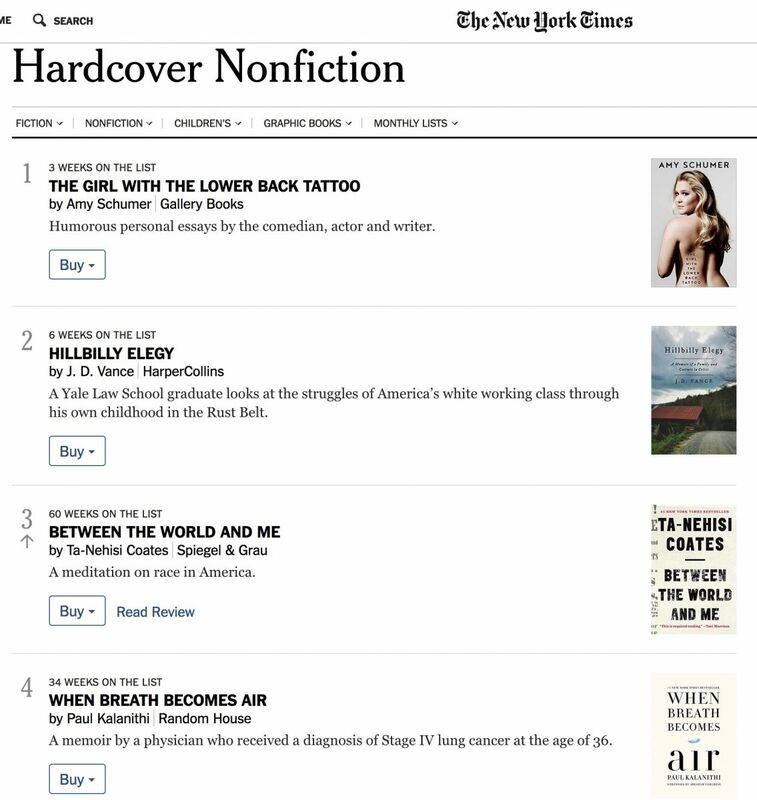 The category you are seeing above is Hardcover Nonfiction -- and there we are at #11. I had this gnawing feeling that we weren't going to get it, though. I was quite disappointed to find out that my intuitive data was accurate in this case. The most astonishing part of this "mystery" is what happens when we compare the titles on the New York Times list with the titles on the Publisher's Weekly list. 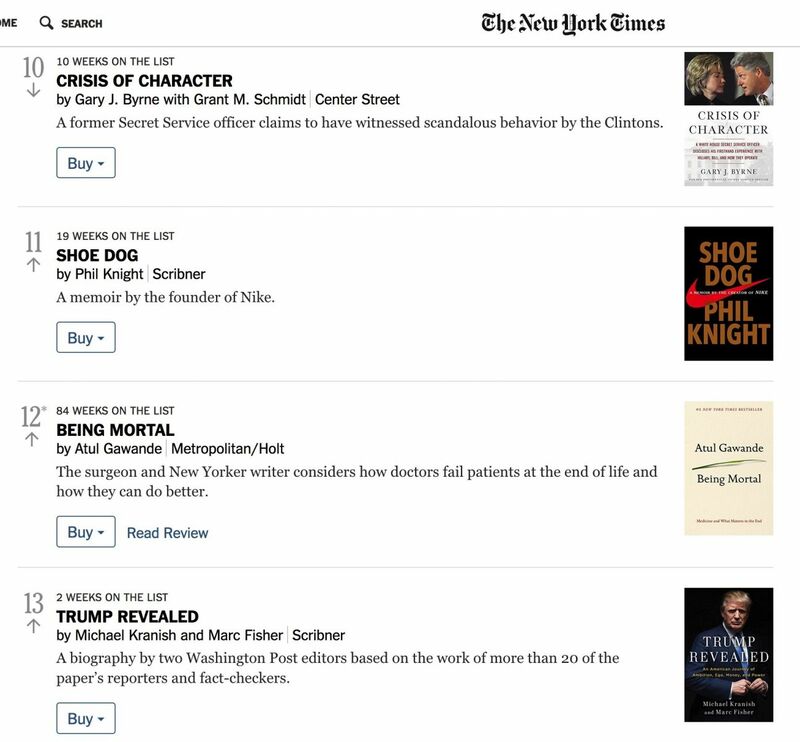 Additionally, Shoe Dog shares the same slot on the NYT as The Ascension Mysteries did in the Nielsen ratings, #11, but appears at #24 on Publisher's Weekly. 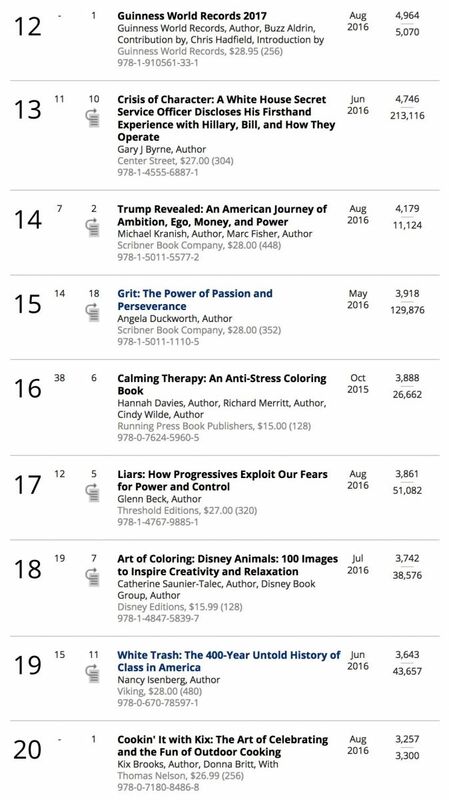 Next, let's take a look at the 12th through 20th slots on the Publisher's Weekly list. If 3,861 units can get you a #18 ranking, then why did The Ascension Mysteries get nothing at all after 5,386 units -- fully 1,525 more books? We have heard directly from multiple insiders that a wide variety of "forbidden" intel appears throughout the book, and particularly in the second half. It would be easy to assume that "someone on the inside" -- i.e. 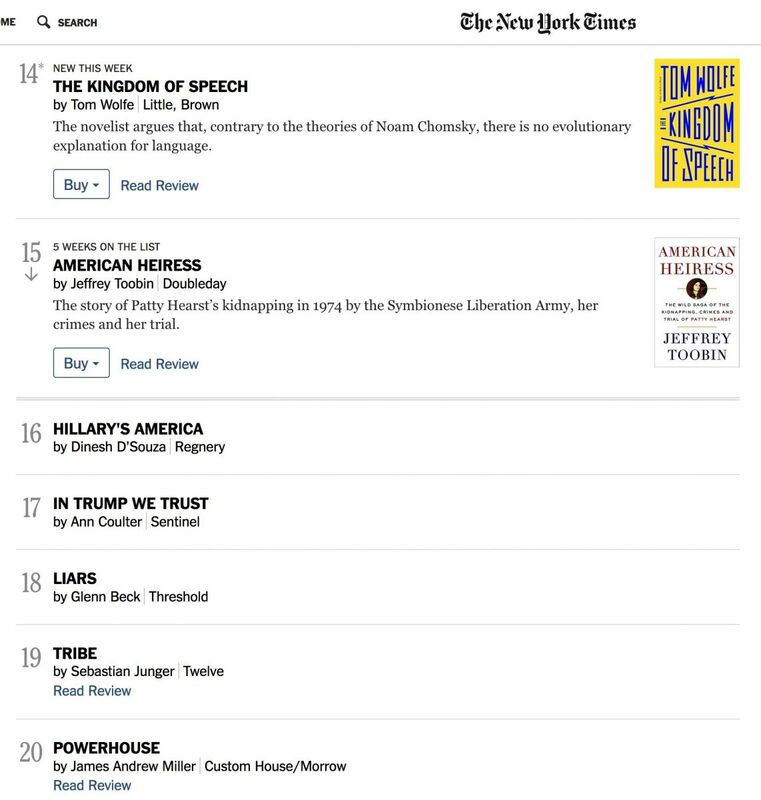 the Cabal -- made damn sure The Ascension Mysteries would never appear on the NYT list. It is therefore possible that this is not the result of any conspiracy, but is just a function of their not "weighing" online sales anywhere near as heavily. At the same time, the total secrecy in which the ranking system takes place allows for the possibility that "edits" could be made. Again, the reason why this is important is not about making money -- it is about the credibility that a New York Times best-seller ranking confers. Hillary and her running mate Kaine's book came out just a week after The Ascension Mysteries did. 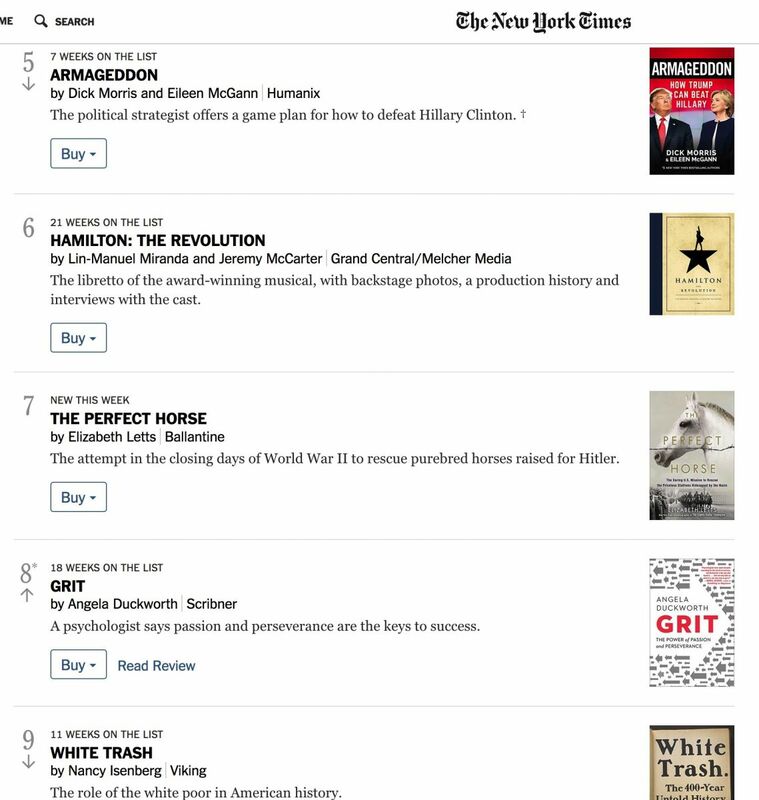 As of right now, Hillary's book has 106 reviews on Amazon, with an average rating of two stars. As of this same moment, The Ascension Mysteries has 234 customer reviews -- over twice as many -- with an average rating of five stars. I wasn't able to see it online after publishing it, since internet access here is highly restricted. The page wouldn't load. Now this morning, very early, it's fine -- and I realized the numbers were hard to see. 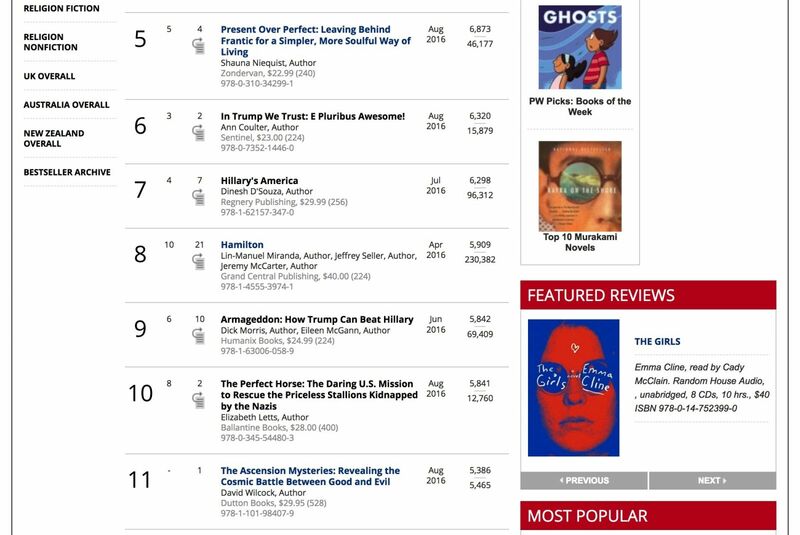 Both books have gotten more reviews just since last night, and particularly Hillary's -- after its failure became a top story on Drudge Report. That is exactly the type of publicity Hillary doesn't want. It is from Jason Parsley on September 15, 2016, entitled "A Meticulously Researched Book of Good Info:"
The Ascension Mysteries is one of the most anticipated releases of 2016. I couldn't wait for this book to come out and David delivered! The first half shows the reader David's personal struggles to find his truth. This is an inspiring section that humanizes this great researcher and thinker. I got a lot out of this section as it adds to Wilcock's credibility and it offers a blueprint for redemption and spiritual growth. New fans will be blown away by David's rigorous research and credible reporting. Wilcock provides us with an excellent updated history of the solar system and a good survey of our current situation. 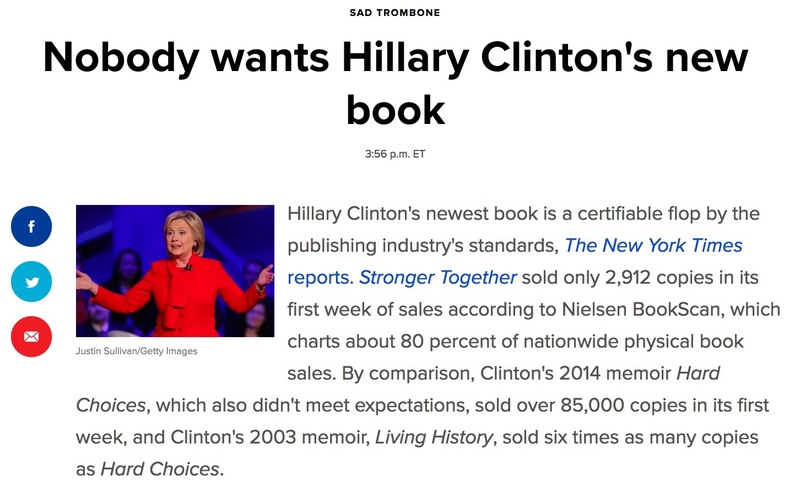 This led The Week to dub Hillary's new book as "a certifiable flop by publishing industry standards." 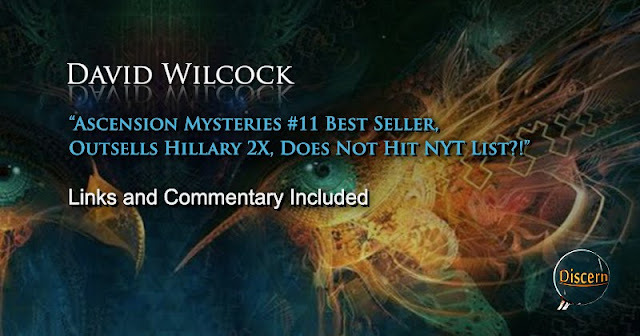 Hillary is getting wall-to-wall mainstream media coverage, whereas The Ascension Mysteries and its writer does not exist in that world whatsoever -- obviously. Hillary has millions of dollars of campaign cash behind her to market this book -- and yet we sold almost twice as many copies upon release.